Correct UV Sterilizer/Clarifier Applications . I often get questions or even complaints about the use of UV Sterilizers/Clarifiers for Aquariums & Ponds. I will answer a couple of questions that indicate the improper of UV Sterilization for Ponds or Aquariums. (1) Question; "My Pond turns pea soup green as soon as my UV Sterilizer UV-C Bulb burns out or is removed"
Answer; This certainly shows that you have a correctly installed and functional UV Clarifier. 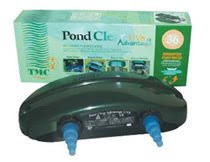 However this also tells me that you depend too much on your UV Clarifier/Sterilizer as although I certainly recommend these devices, a pond keeper should not have a system that is all or nothing as per the UV Clarifier. I strongly suggest increasing filtration, especially bio filtration that removes many of the nutrients necessary for an algae bloom. A Bio Falls Filter (either purchased or DIY), a Pressurized Pond Filter can either be added or even duplicated. Another type of Filter I set up in over 90% of my ponds is the "Veggie Filter". Properly constructed, these plant filters can really "scrub" many nutrients otherwise utilized by free floating algae. I have found in ponds with good mechanical/bio filters such as a Pressurized Pond filter along with a Veggie Filter rarely got overly green in summer when the UV Clarifier was disconnected or broken down. (2) Question: "I have been told a UV Sterilizer does not really help a saltwater or freshwater aquarium other than clarity. I did not see any difference than this when I added a 9 Watt UV Sterilizer to my aquarium sump (a pump rated at 900 gph)"
"UV Sterilization; Facts and Myths"
A few points: First of all, 900 gallons per hour is much too fast for a 9 Watt UV to perform Sterilization, and likely little clarification either. *Many persons who slam UV Sterilizers for aquarium use, have them incorrectly installed or are utilizing Sterilizer/Clarifier devices of poor quality for anything other than clarification, such as the Green Killing Machine". Flow Rate; this should be 45-60 gph per watt for Clarification, 20-35 gph per watt for level 1 Sterilization, & 8-12 gph per watt for level 2 Sterilization. For more in depth exposure time information, please see “UV Sterilization; UVC Penetration (Microwatts second/cm2)”. See the sections dealing with UV-C Penetration gives a more detailed explanation of the time required to kill pathogens based on wattage & distance for the UV-C source. For example the bacteria Vibrio requires a UVC exposure of 6500 mW/cm2 or more, this means an exposure time of 5.68 seconds for a 9 watt UV lamp is required to kill this pathogen. UV-C Penetration; in simple terms this is often a problem with the equipment itself with too much distance from the bulb to the outer wall of water containment resulting in much of the water not being properly irradiated even with proper flow rate or turnover rate. Examples are Canister/Pressurized filters equipped with built in UV-C Lamps, internal UVs such as the before noted Submariner/Killing machine, or even otherwise good UVs with baffles to slow water flow but in turn keep much of the water at too great a distance form the UV-C Irradiation. I have been considering adding one of these to by pond. Great article. I think you have convinced me to make the plunge and go ahead and add one in. I hope it helps my pond out and solves some of the problems ive been having.